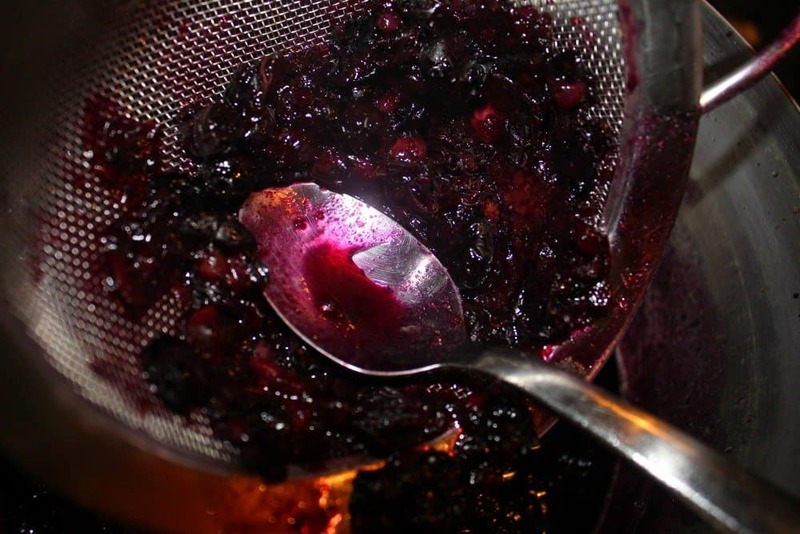 This homemade blueberry syrup recipe is not only decadently delicious, it is made using just 2 natural ingredients. The rich blueberry flavor will add a punch to your morning meal, without the guilt that typically comes from consuming chemicalized name-brand syrups. And with so few ingredients, it’s also the perfect recipe to make with kids! This syrup was honestly so delicious over my french toast last week, that I actually licked the plate. Full-on, totally unashamed plate licking, and it was SO satisfying. Another added bonus is that this syrup if totally GMO free with no high-fructose corn syrup in sight. Cheers to that! 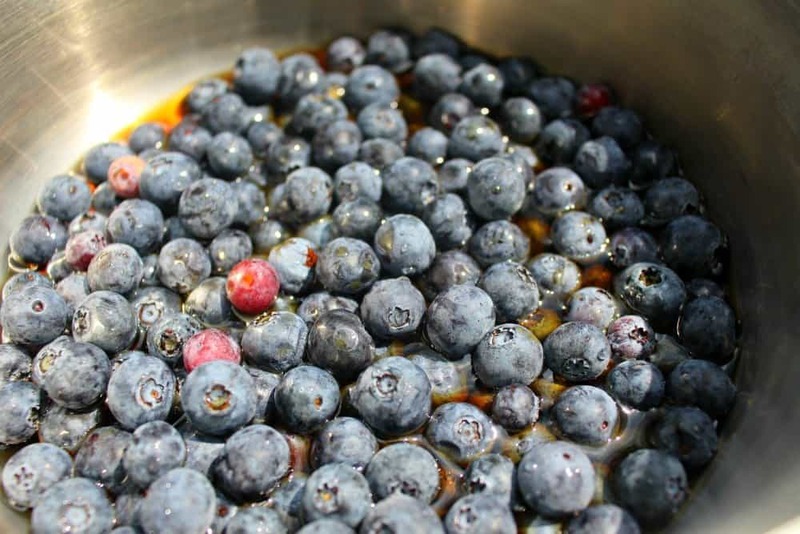 Begin by washing and measuring 2 cups of fresh blueberries. Then, place them in a medium sauce pan and pour the maple syrup on top. Bring the mixture to a full boil and then reduce to simmer over medium heat. Maple syrup, like all sugars can burn very quickly. For this reason, you will want to baby the pot. Stir it almost constantly. 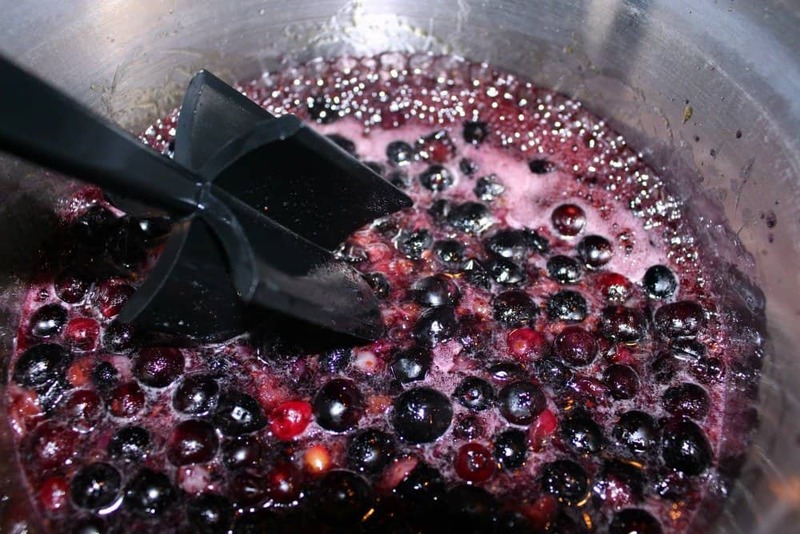 Stirring will also help the blueberries to breakdown. After about 10 minutes, the blueberries will be broken down enough that you can squish them through the strainer to remove the skins. This is an optional step and should only be done if you need completely smooth syrup. I was using my syrup for a trifle and wanted it to be smooth. Typically, I would leave the skins in for the nutrients. Continue to simmer the syrup for an additional 10 minutes (20 minutes total), stirring almost constantly. During these final 10 minutes, whether you remove the skins or not, the syrup will naturally start to reduce and thicken. There is no need to add any cornstarch or flour. Allow the syrup to cool slightly before pouring it into your serving container. Enjoy over pancakes, french toast, biscuits, English muffins, or anything else that suits your undoubtedly refined fancy. Happy cooking! Oh yum!!!! This sounds fantastic- I love that you used syrup instead of sugar and water! How yummy! Also I haven’t been on this blog before- but the smokies are fantastic! We always used to go on vacation there when I was little (we’re in wv). Love the blog! Thank you so much. We actually almost moved to the mountains of WV, but at the last minute decided on TN instead. They are both such beautiful states! This sounds good! I think it would be perfect for french toast or pancakes… ice cream? ! Ice cream sounds absolutely amazing! You couldn’t make that any easier could you 🙂 Perfect with pancakes or even in a glass of sparkling wine. Wine sounds delicious! What a creative idea!